The Water District's three treatment plants are in continuous motion. During an average summer day they produce about 16 million gallons of treated drinking water and 6 million gallons of clarified water for industrial use. RAW WATER - Making raw water safe to drink starts at the intakes on the Nueces River and at Lake Texana where screens remove leaves, sticks, fish and other large debris. The water from these two sources is pumped to the 192 million gallon Naismith Reservoir where the two water sources continue to blend and some suspended solids fall to the bottom. As the water from the reservoir flows by gravity to the treatment plants it receives the first chemical treatment using chlorine dioxide for algae control and as a total organic carbon (TOC) removal aid. Algae can impart taste and odor and TOC is a precursor for disinfection by-product formation. COAGULATION/ FLOCCULATION/ SEDIMENTATION - Aluminum sulfate (alum) is added as a coagulant. The amount added depends on the concentration of particles contained in the raw water. The addition of alum causes particles to clump together, thus becoming heavy enough to begin settling to the bottom of the sedimentation basins. The solids collected in the sedimentation basins are disposed of through land application. The clarified water flows on to the filtration step in the treatment process. FILTRATION - As settled and clarified water enters the filters additional chlorine dioxide is added to continue the control of algae. Filtration then removes the remaining suspended particles. In Plants A and B this is accomplished using dual media filters consisting of anthracite and sand. Plant C uses a hollow fiber microfiltration system. POST TREATMENT - As the filtered water exits the filters zinc orthophosphate	is added as a corrosion inhibitor to protect the distribution system and in-home pipes. Fluoride is added to reduce tooth decay in children and sodium hydroxide (caustic) is added to balance the water's pH, making it non corrosive. DISINFECTION - Chlorine and ammonium sulfate are combined in a specific ratio to form chloramines. Chloramines are added to the filtered water stored in large ground storage tanks where it is stored while waiting to be pumped into the transmission system. Chloramines provide a longer lasting disinfection residual than chlorine alone and do not form regulated disinfection by-products. DISTRIBUTION - The finished drinking water is pumped to the individual city water storage tanks for eventual city distribution to end customers. 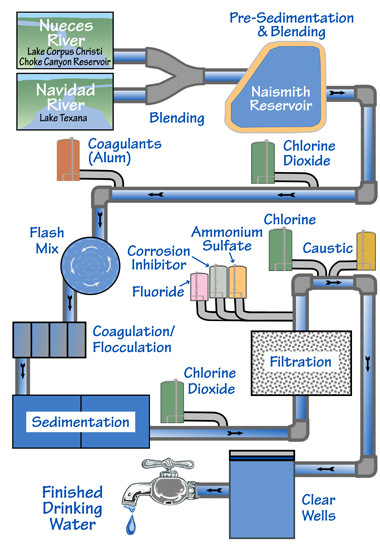 You can learn more about water treatment in the Glossary.